The euro is being pressured by a rumor placed in Der Spiegel about Greece potentially leaving the EU. While I don't think this carries much water because too many players have too much invested in keeping the EU together, it most likely would be the best way for Greece to resolve its issues. It could then turn into a mini US, print money to its heart's content and devalue the currency. Greece is no stranger to defaulting on its debts so nothing new there. At this point all the periphery countries simply are uncompetitive with the euro at these levels, so they are facing years upon years of issues. 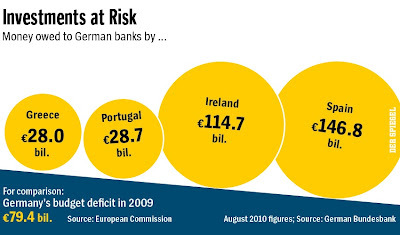 Of course all these bailouts for Greece, Ireland, and Portugal are truly bailouts for the banks of Germany, France, and UK. This rumor has strengthened the dollar, weakened the euro, and of course if the dollar rallies everything else must be sold. We are back the "stupid" market where everything is a binary trade. Ironically a year ago today we had the flash crash - if you remember, the market was down significantly early in the day due to (wait for it)..... the Greek debt crisis. The debt crisis in Greece has taken on a dramatic new twist. Sources with information about the government's actions have informed SPIEGEL ONLINE that Athens is considering withdrawing from the euro zone. The common currency area's finance ministers and representatives of the European Commission are holding a secret crisis meeting in Luxembourg on Friday night. Greece's economic problems are massive, with protests against the government being held almost daily. Now Prime Minister George Papandreou apparently feels he has no other option: SPIEGEL ONLINE has obtained information from German government sources knowledgeable of the situation in Athens indicating that Papandreou's government is considering abandoning the euro and reintroducing its own currency. Alarmed by Athens' intentions, the European Commission has called a crisis meeting in Luxembourg on Friday night. The meeting is taking place at Château de Senningen, a site used by the Luxembourg government for official meetings. In addition to Greece's possible exit from the currency union, a speedy restructuring of the country's debt also features on the agenda. One year after the Greek crisis broke out, the development represents a potentially existential turning point for the European monetary union -- regardless which variant is ultimately decided upon for dealing with Greece's massive troubles. Given the tense situation, the meeting in Luxembourg has been declared highly confidential, with only the euro-zone finance ministers and senior staff members permitted to attend. Finance Minister Wolfgang Schäuble of Chancellor Angela Merkel's conservative Christian Democratic Union (CDU) and Jörg Asmussen, an influential state secretary in the Finance Ministry, are attending on Germany's behalf. "It would lead to a considerable devaluation of the new (Greek) domestic currency against the euro," the paper states. According to German Finance Ministry estimates, the currency could lose as much as 50 percent of its value, leading to a drastic increase in Greek national debt. Schäuble's staff have calculated that Greece's national deficit would rise to 200 percent of gross domestic product after such a devaluation. "A debt restructuring would be inevitable," his experts warn in the paper. In other words: Greece would go bankrupt. What is certain, according to the assessment of the German Finance Ministry, is that the measure would have a disastrous impact on the European economy. "The currency conversion would lead to capital flight," they write. And Greece might see itself as forced to implement controls on the transfer of capital to stop the flight of funds out of the country. "This could not be reconciled with the fundamental freedoms instilled in the European internal market," the paper states. In addition, the country would also be cut off from capital markets for years to come. In addition, the withdrawal of a country from the common currency union would "seriously damage faith in the functioning of the euro zone," the document continues. International investors would be forced to consider the possibility that further euro-zone members could withdraw in the future. "That would lead to contagion in the euro zone," the paper continues. Moreover, should Athens turn its back on the common currency zone, it would have serious implications for the already wobbly banking sector, particularly in Greece itself. The change in currency "would consume the entire capital base of the banking system and the country's banks would be abruptly insolvent." Banks outside of Greece would suffer as well. "Credit institutions in Germany and elsewhere would be confronted with considerable losses on their outstanding debts," the paper reads. The European Central Bank (ECB) would also feel the effects. The Frankfurt-based institution would be forced to "write down a significant portion of its claims as irrecoverable." In addition to its exposure to the banks, the ECB also owns large amounts of Greek state bonds, which it has purchased in recent months. 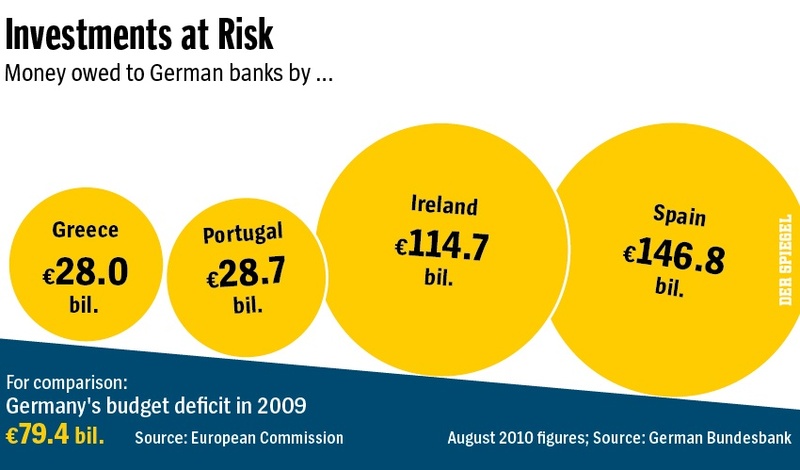 Officials at the Finance Ministry estimate the total to be worth at least €40 billion ($58 billion) "Given its 27 percent share of ECB capital, Germany would bear the majority of the losses," the paper reads. In short, a Greek withdrawal from the euro zone and an ensuing national default would be expensive for euro-zone countries and their taxpayers. Together with the International Monetary Fund, the EU member states have already pledged €110 billion ($159.5 billion) in aid to Athens -- half of which has already been paid out.